Headaches are so common that we consider them a normal side effect of life. But they’re just like any other form of pain: a signal that something is off and should be investigated. Common headache causes or triggers include food and environmental sensitivities, light, noise, lack of sleep, caffeine withdrawal, extreme exercise, nutrition and stress. However, another cause is something that often goes unidentified: the malfunction of spinal bones in the head, neck, and upper shoulders, which can irritate or overstretch spinal nerves and tissues. This is where chiropractic care can adjust alignment and return the area to proper functioning, improving the health of the nervous system and providing some relief. Only a small percentage of headaches are attributed to external factors; the majority are considered to be primary headaches, which include tension, cluster, and migraine. These headaches are considered to be not circumstantial or secondary occurrences, but the main syndrome. Primary headaches are thought to be caused by muscle tension in the cervical spine that can either occur immediately or build up from lifestyle habits, including unaligned posture and lack of exercise; this muscle tension affects the cranial nerves. As a population that now mainly works at desks and reads on their phones, we’re more vulnerable than ever to primary headaches caused by spinal misalignment from posture. The 24 mobile spinal bones can lose a healthy position and range of motion from injuries, aging, and everyday activities. 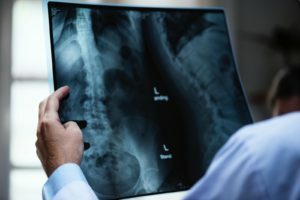 With the nervous system protected by the spine, any spinal malfunction or loss of agility affects everything from pain levels to balance and resistance to disease, so monitoring and care of the spinal bones is critical. At Petett Chiropractic, our highly trained doctors are caring for the protection of the nervous system by the spine. While every patient’s body is different and responds to treatment in its own way, the spinal correction of chiropractic care can ease headache symptoms and often address the root cause of most primary headaches. For headache treatment, a chiropractic adjustment, manipulation and palpation of the upper two cervical vertebrae, closest to the base of the skull, can be extremely helpful to relieve the muscle tension caused by overstretching or constriction. Getting proper spinal analysis through X-rays, palpation, and a thorough physical history, as well as counseling on nutrition and lifestyle habits, is part of the treatment to help headaches occur less frequently and increase quality of life. The doctors at Petett Chiropractic help relieve headaches through adjustments and advice on nutrition, posture, and exercise. Schedule a consultation with our Renton chiropractors to learn about chiropractic as an alternative treatment for headaches!